President George W Bush's latest speech on Iraq was something of an oddity. Billed as a televised appeal to the American people, few Americans actually watched. The White House did not request the major television networks to carry it, so they did not, leaving coverage to little-watched cable news channels. Officials say the aim of the speech, whatever the audience, is to explain just why the president considers Saddam Hussein such a threat and why doing nothing in the face of that threat is not an option. This was an attempt by President Bush to reach out to the American people that something needs to be done about Iraq, and opinion polls show the American people do need some convincing. Although a majority support military action against Iraq, most Americans are in no rush to go to war. Polls show the Americans want the administration to pursue diplomatic avenues first. And Americans certainly do not want a war where the US has to go it alone. In many ways the speech covered familiar ground, but the format was new. The president posed and then attempted to answer the questions many Americans and members of Congress have been raising, such as why Iraq, why now and what would happen in a post-Saddam Iraq. Dealing with the issue of why Iraq posed such a serious threat, he said it was the combination of weapons of mass destruction and a merciless regime. He made the case for urgent action by saying that if Iraq already possessed weapons of mass destruction that delay would only make the situation worse. Anticipating the question that an attack on Iraq would distract from the war on terror, he linked the two issues and told of how the Iraqi regime had sheltered and provided support to terrorists. And he tried to answer the question of whether an attack on Iraq would only worsen the position of the United States in the Arab world. His answer was to say that the US position in the eyes of Arabs could not get any worse, and he pledged to help the Iraqi people in a post-Saddam world. By making this case to the American public, Mr Bush wanted to put pressure on Congress to pass a strongly worded resolution authorising the use of force. And he wanted to keep up the pressure on the United Nations and on Baghdad. His format and his delivery were a calculated attempt to make his case and demonstrate his resolve. He was firm and measured, avoiding sounding gung-ho and acting presidential. But he did issue a not-so-veiled threat to Iraqi generals. The US did not want war, Mr Bush said, but if it came to that, he put Iraq's generals on notice not to follow any desperate orders to use weapons of mass destruction. If they did, he said they would be prosecuted as war criminals. Mr Bush has a lot less work to do to convince the American people that action against Iraq is necessary than if he were trying to convince Europeans or people in the Arab world. Most Americans take a dim view of Saddam Hussein and need little convincing that he is a threat. That does not mean they want to go to war tomorrow. But whether this speech was successful in selling the American people on the necessity of action now, only time and the polls will tell. : By Rob Watson : BBC Washington Correspondent : : : President George W Bush's latest speech on Iraq was something of an oddity. : Billed as a televised appeal to the American people, few Americans actually watched. : The White House did not request the major television networks to carry it, so they did not, leaving coverage to little-watched cable news channels. : Officials say the aim of the speech, whatever the audience, is to explain just why the president considers Saddam Hussein such a threat and why doing nothing in the face of that threat is not an option. 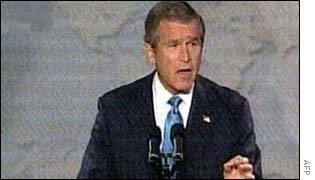 : Questions and answers : This was an attempt by President Bush to reach out to the American people that something needs to be done about Iraq, and opinion polls show the American people do need some convincing. : Americans are not in a rush to go to war : : Although a majority support military action against Iraq, most Americans are in no rush to go to war. : Polls show the Americans want the administration to pursue diplomatic avenues first. : And Americans certainly do not want a war where the US has to go it alone. : In many ways the speech covered familiar ground, but the format was new. : The president posed and then attempted to answer the questions many Americans and members of Congress have been raising, such as why Iraq, why now and what would happen in a post-Saddam Iraq. : Dealing with the issue of why Iraq posed such a serious threat, he said it was the combination of weapons of mass destruction and a merciless regime. : He made the case for urgent action by saying that if Iraq already possessed weapons of mass destruction that delay would only make the situation worse. : Anticipating the question that an attack on Iraq would distract from the war on terror, he linked the two issues and told of how the Iraqi regime had sheltered and provided support to terrorists. : And he tried to answer the question of whether an attack on Iraq would only worsen the position of the United States in the Arab world. : His answer was to say that the US position in the eyes of Arabs could not get any worse, and he pledged to help the Iraqi people in a post-Saddam world. : Keeping up the pressure : By making this case to the American public, Mr Bush wanted to put pressure on Congress to pass a strongly worded resolution authorising the use of force. : And he wanted to keep up the pressure on the United Nations and on Baghdad. : His format and his delivery were a calculated attempt to make his case and demonstrate his resolve. : Mr Bush put Iraqi generals on notice not to use weapons of mass destruction : : He was firm and measured, avoiding sounding gung-ho and acting presidential. : But he did issue a not-so-veiled threat to Iraqi generals. : The US did not want war, Mr Bush said, but if it came to that, he put Iraq's generals on notice not to follow any desperate orders to use weapons of mass destruction. : If they did, he said they would be prosecuted as war criminals. : Mr Bush has a lot less work to do to convince the American people that action against Iraq is necessary than if he were trying to convince Europeans or people in the Arab world. : Most Americans take a dim view of Saddam Hussein and need little convincing that he is a threat. That does not mean they want to go to war tomorrow. : But whether this speech was successful in selling the American people on the necessity of action now, only time and the polls will tell.